Cities around the world will participate in Earth Hour on Saturday, turning off their lights to raise awareness for energy conservation. You might remember that last year we “turned the lights out” on the Google.com homepage during Earth Hour to symbolize our own commitment to sustainability. We won’t be turning out the lights on our homepage again this year. Our users come first, and while we received lots of enthusiastic feedback last year, some found an all-black Google.com to be a little confusing. (Also, darkened screens don’t actually save energy — modern displays use the same amount of power regardless of what they display.) 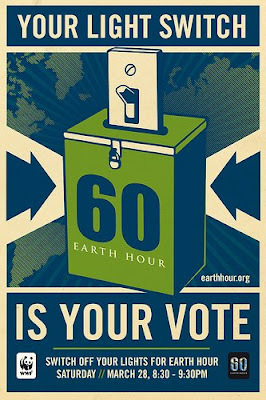 We are actively supporting this year's Vote Earth, an Earth Hour 2009 initiative to gather one billion words to present at the United Nations Climate Change Conference in Copenhagen in December of this year. Participants can share their opinions about climate change through the Earth Connect social platform which incorporates Google tools including Google Maps, App Engine, Friend Connect, Google Translate, Blogger and Feedburner. LEED (Leadership in Energy and Environmental Design) Green Building Rating System. We're excited about this certification because it means we're on the right track with our approach to building environmentally sound offices. Here are a few of the design strategies we implement to make our office buildings as green as possible. We thought they might even give you some ideas for greening your own home. We have frugal roots from our start-up days, so when we remodel an office, we reuse as many materials as possible. This strategy saves us money, and it avoids the environmental footprint associated not only with manufacturing and transporting new goods, but also with disposing of the old stuff. Construction and demolition waste makes up about 40% of the solid waste stream in the U.S. In the San Francisco office, we reused everything from partition walls and door assemblies to carpet and furniture left behind by the previous tenant. Plus, more than 64% of what we did throw away was recycled. Sometimes, the simplest defense is the best defense, like the "Larry and Sergey Sniff Test": if it smells bad, it's probably bad for you (Larry and Sergey are a little busy to do all the sniffing themselves, so we help them out sometimes). The all-too-familiar new paint or new carpet smell is usually the sign of toxic VOCs (volatile organic compounds) off-gassing into the air we breathe. Of course, we have to go on more than just our noses, so we also rely on third-party certification programs (like Cradle to Cradle, Scientific Certification Systems, and those incorporated into LEED) and information from manufacturers to ensure that we use the healthiest products available. All the paints, sealants, adhesives, carpet, and furniture we purchased for the San Francisco office had the lowest possible levels of VOCs and formaldehyde, both of which have adverse effects on indoor air quality and long-term health. We also looked for sustainable materials that are locally manufactured, high in recycled content, and free of environmentally harmful materials like PVC. We make every effort to heat, cool and light our offices with the minimal amount of energy needed, and use building controls to ensure these systems are only on when we need them. Some of these strategies work everywhere, like installing motion sensors to control lighting and purchasing Energy Star-rated office equipment in the U.S. Other times, solutions are more site specific. In San Francisco, like many of our offices, we lease space in a building with many other tenants, which can often be an obstacle to implementing measures to save energy. We worked side by side with our landlord to retrofit the existing HVAC (heating, ventilation, air conditioning) system to make it more efficient. At our headquarters in Mountain View, we have a 1.6MW PV system, as well as a cutting-edge building management system that monitors and controls all of our energy use across campus (like PowerMeter, but with a few more bells and whistles). Water is one of our planet's most undervalued natural resources, and we're always looking for innovative and cost effective ways to use it more wisely. In San Francisco, as well as most of our other offices, we installed efficient faucets and flush valves in the bathrooms and kitchens. In locations where we have more green space like Mountain View, we use drought-resistant landscaping when possible. We just opened a new office in Sydney (which is undergoing Green Star certification through the Green Building Council of Australia), where waste water will be treated and recycled for toilet flushing and irrigation. If you visit the San Francisco office, you might not notice the low-VOC carpet, but you definitely won't miss the spectacular views of the San Francisco Bay and the Bay Bridge. Access to natural light and views increases Googler productivity and happiness, and decreases our energy costs by reducing the need for artificial lighting. Plus, like many of our offices, the San Francisco office is centrally located and easily accessible by public transit. We also provide preferred parking for carpools and vanpools, on-site bike storage, showers and changing facilities. We've done a lot of work to be greener, but that doesn't mean we've reached the end of the rainbow and that pot of gold yet. We're constantly learning more about green building and ways to save energy. However, on this greenest of holidays, we're wearing the LEED certification of the San Francisco office as a badge of green pride -- a shamrock, you could say. At Google, we strive to be green all year round, not just on St. Patrick's Day. We've been working hard to design our offices around the world to be as environmentally friendly as possible. We have a set of internal Workplace and Sustainability Design Guidelines which we use to ensure that we're providing healthy and productive workplaces for Googlers everywhere. In San Francisco, our office was recently rated Gold by the U.S. Green Building Council's LEED (Leadership in Energy and Environmental Design) Green Building Rating System. We're excited about this certification because it means we're on the right track with our approach to building environmentally sound offices. In addition to exploring the job growth numbers, you can view a 3-D simulation of the job growth over time and compare the solar energy resources of each state with their job growth potential. In the additional data, you can also see solar installations, like photovoltaic panels and solar water heating at the Georgia Tech Aquatic Center in Atlanta and a solar power tower at the Solar Energy Generating Systems (SEGS) in Southern California, to see what they actually look like in Google Earth. Because predicting job creation in the future relies on advanced economic modeling, it can be difficult to predict where all the solar jobs will be created. Nearly 30,000 jobs will likely be created across the other 29 states that aren’t explicitly covered in this map. That means solar energy truly is capable of creating a green economy for the entire U.S. 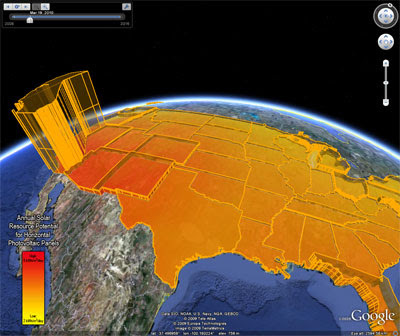 This map was created as part of SEREF’s and Google.org’s shared objective to rapidly scale-up the use of solar technologies in the U.S. so that the environmental, economic, and national security benefits of renewables can be realized. To check out the map and learn more about solar energy, please visit the solar jobs map site. Solar energy has long been touted as a clean alternative to traditional electricity generation, but building a clean energy economy will also create jobs. Thanks to federal and state policies to support renewable energy, it's estimated that the solar industry will create hundreds of thousands of green jobs in coming years. 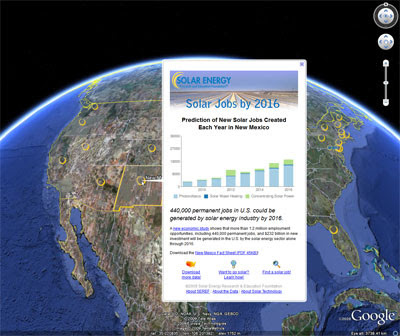 Based on a study by Navigant Consulting, and with the help of Google.org and Google Earth Outreach, our friends at the Solar Energy Research Education Foundation (SEREF) have developed a U.S. solar jobs map in Google Earth. You can also view this as a KML in Google Earth. The U.S. solar industry is expected to support more than 440,000 permanent, full-time jobs, including many in the manufacturing and construction industry, by the year 2016. The solar jobs growth layer shows where these jobs are likely to be created across the country. You'll see that many of these jobs are being created in states that have experienced the worst of the current economic crisis, including Pennsylvania, Michigan, and Ohio. Clicking on the solar icon in each state shows annual job growth over an eight year period, as well as how the three most common solar technologies—photovoltaics, concentrating solar power, and solar water heating—stack-up in terms of job creation. on your computer and buying more efficient computers, you can save nearly half a ton of CO2 and more than $60 a year in personal energy costs. To do our part, Google co-founded the Climate Savers Computing Initiative (CSCI) to promote a smarter, greener computing future. The simple changes above can have a HUGE collective impact; our goal is to reduce carbon dioxide emissions by 54 million tons per year by 2010 — the equivalent of taking 11 million cars off the road. The biggest obstacle we face is not technological, it's awareness. That's why we're excited that CSCI has launched the Power Down for the Planet video contest, a challenge to you and your friends to develop original and creative videos that educate, entertain, and inform others about the importance of energy efficient computing. So pick up a camera and make a video telling your own Climate Savers Computing story. How will the environment benefit from advances in computer power management? How do poor computing practices waste energy? What does a sustainable computing future look like to you? Let your imagination go wild. Join us, gather some friends, and broadcast your vision of efficient computing. The team with the most compelling video can win up to $5,000 and energy efficient laptops; students at participating universities are also eligible to win $5,000 and Specialized Globe bicycles. We can't wait to see what you create. Do you leave your fridge door open after grabbing what you need? Do you leave your vacuum cleaner running when you aren't cleaning? Of course not. The idea of doing either of these things sounds silly, yet many people don't think to turn off their computers after using them. By using power management tools on your computer and buying more efficient computers, you can save nearly half a ton of CO2 and more than $60 a year in personal energy costs.